This SQL Tutorial focuses on the Oracle DML statements. DML (Data Manipulation Language) statements are the element in the SQL language that is used for data retrieval and manipulation. Using these statements you can perform operations such as: adding new rows, updating and deleting existing rows, merging tables and so on. Please note – the SQL SELECT statement, another DML component, is not covered in this tutorial. For more details about the SQL SELECT statement please use the following link. Default value – when creating a new table (DDL), it is possible to define a specific column with a default value. This means that unless otherwise indicated, this is the value that you would like to enter into the field of that column. For example: default price is 50, and default expiration date is ’01-JAN-2020′. The following demonstrations are based on the table below, where the default value 57 is assigned to the product_price column and currently the table has a single row. The order of the values must match the order of the columns in the table. In the case above, the first value must be associated with the product number column, the second value must be associated with the product name column, and so on. The value type must match the type of columns in the table. For example, it is not possible to enter the value 37 into the expiration_date column. The number of values – must match the number of values in the table. It is not possible to enter more or less values than the number of values in the table (in this case, 4 values). To enter a NULL value into one of the fields of one of the columns, the NULL keyword should be used. To enter a DEFAULT value into one of the fields of one of the columns, the DEFAULT keyword should be used. SYSDATE – you can use the SYSDATE function instead of writing a date. The order of the values must match the order of the columns in the column list. In the case above, the first value must be associated with the product number; the second value must be associated with the product name, and so on. The value type must match the type of columns in the column list. For example, it is not possible to enter the value 37 into the expiration_date column. The number of values – must match the number of values in the column list. Therefore, there is no need to enter a value into each column of the table. A NULL value is entered into a column that was not specified in the column list, if no default value exists; otherwise, the DEFAULT value is entered. To enter a NULL value explicitly into one of the fields of one of the columns, the NULL value should be specified. To enter a DEFAULT value explicitly into one of the fields of one of the columns, the DEFAULT value should be specified. GETDATE – you can use the SYSDATE (SYSDATE in Oracle) function instead of writing a date. This method allows copying data items from another table into the requested target table. It is not mandatory to include a WHERE statement in the query; however, including such a statement is advisable if you would like to avoid copying the entire table. The Oracle UPDATE statement is used to modify existing rows. It is possible to update to a NULL or DEFAULT value. Executing the Oracle UPDATE statement without using the Oracle WHERE clause results in updating all of the fields in a column. The Oracle DELETE statement is used to remove existing rows from a table. A subquery can be nested in the DELETE statement. Executing the Oracle DELETE statement without using the Oracle WHERE clause, results in the deletion of all of the rows in the table. It is not possible to delete only a single field by using the Oracle DELETE statement .The Oracle DELETE statement deletes rows. You can write a Oracle DELETE statement either with or without the Oracle FROM keyword. The Oracle MERGE statement is used to synchronise the data of two tables, based on differences found between them, if the same row exists in both tables (row with the same customer id for example), but still each row has different values (each table holds a different phone number of that customer), UPDATE operation will be executed. If the row only exists in one table, INSERT operation will be executed. This sample demonstrates the merge concept. At the end of each month, the data of Customers table is merged with the data of the Backups table. In the beginning of the month, the only MERGE activity was transferring (INSERT) all rows, as is, to the Backup table (provided that this was the first time that the Backup table was populated). For customers that already exist in the backup table, an UPDATE operation is carried out, for example, George’s Internet Package will be changed from 2.5 MB to 5.0 MB. For new customers, an INSERT operation is carried out, thereby adding a new customer – for example, Roy– to the backup table. INSERT VALUES  (source_table_alias.column, source_table_alias.column .. Transactions are a single unit of various modification commands (such as UPDATE, INSERT, DELETE), which in most cases are associated with a single logical group. The term “a single logical group” refers to a set of operations with logical connection; for example: a batch of DML operations that are meant for updating specific data items in the customers table. The COMMIT command used to save all changes made by the transaction in the database. The COMMIT command saves all modifications since the last COMMIT or ROLLBACK command. 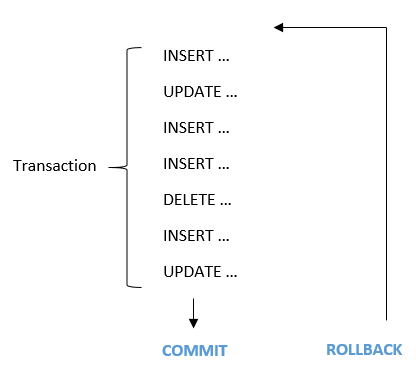 The ROLLBACK command used to undo changes made by a transaction. The ROLLBACK command can only undo modifications since the last COMMIT or ROLLBACK command that was issued.